If you love to incorporate shaped seed beads and other small accent beads into your work, nothing beats pearl netting for satisfying a craving for rounds. This variation of tubular netting - which is really a spin-off of tubular peyote - works with just about any round bead you can think of, so long as it has holes suitable for the weave. Druks, firepolish, gemstone rounds, and pearls are all gorgeous when netted. In this tutorial, we’ll be working with 4mm druks and 15/o seed beads - with 11/o anchors. If you want to use larger beads, you can adjust both the seed bead sizes and quantities used until you get a net that fits your accents. Try experimenting with different combinations, but remember that if your nets are too small, the accent beads will get lost inside the beadwork. Less is not more when it comes to this stitch. When in doubt, add more beads to your nets and test the fit with one or two rounds. Start with a comfortable length of beading thread. Pick up one 11/o seed bead and one 4mm druk four times. Slide them down to the end of the thread, leaving about a 6 inch tail. Pass through all 8 of the beads again, and pull snug to begin forming a small ring. Stitch through the first 3 beads again so that your thread is exiting from an 11/o seed bead. Pull the thread snug. Pick up three 15/o seed beads, one 11/o, and three more 15/o seed beads. Stitch through the following 11/o seed bead in the ring, and pull the thread snug. Repeat for each of the remaining 11/o’s, until you have a flower-shape. Step up by stitching through the first 4 beads added in this round, so that your thread is exiting from an 11/o bead on the edge. Pick up one 4mm druk, and stitch through the following 11/o seed bead in the previous round. Repeat 3 times - don’t worry about pulling the thread tight until you’ve added the final druk. Gently push the beadwork into a tube shape and pull the thread snug, then stitch through the first druk added in this round, and the following 11/o seed bead to step up. Pick up three 15/o, one 11/o, and three 15/o. Stitch through the next 11/o seed bead in the base. Repeat three times and step up, then add the next round of druks. Continue weaving the pattern until your netting reaches the desired length. Finish with a round of druks, then stitch through all of the beads in the final round a second time to secure them. A short length of pearl netting is great for earrings or a pendant. Longer pieces can be strung with other beads for bracelets and necklaces, or stitched together for a very dramatic focal piece. By increasing or decreasing the size of your round beads and the quantity of net beads, you can create unique shapes such as spheres and donuts or - my favorite - strawberries! I had nearly run out of exciting, inspiring bead faves when the time came to stock up again. I’ve been slowly cultivating the supplies I need for my top secret project, and they are all totally gorgeous. This month I’m really excited about blues, and a few fun shapes. Now that I’ve been back to using Czech seed beads for awhile, I’m rediscovering some old favorites. There are several different shades of AB hanks ready and waiting, and these dark blue ones are a favorite. What I love about this finish is that the beads look like one color and a mix all at the same time, and they’re fun to pair with opaque contrasts. I also treated myself to a new strand of freshwater pearls, and there’s no beating the amazing shade of blue in these ones. I love the shine and the shape, but mostly the solid weight of a great round pearl. It's almost a shame to take them off the strand - they look so gorgeous all in a row. These turquoise pearls are going to be perfect in some ocean themed designs. Finally, I’ve stocked up on Rizo seed beads in a few new colors, including black and white. I’ve played a little bit with this shape in the past few weeks and I love how they work as drops, not just in fringe but incorporated into beadwork as well. They've got the same appeal as daggers, but the delicate feel of seed beads. I'm really excited about using the white ones, which have just a tiny bit of translucence to them. What kinds of beads are you into right now? I’m feeling rather sad and annoyed with how my bead tray is looking this week. I had been hoping to share a look at a nearly finished collar, or perhaps an entirely new project altogether. Unfortunately, right after sitting down to work out a pattern for this piece, I came down with a wicked cold, and haven’t been able to add a stitch. I’m not quite happy with the pattern that I started with, and I’ll be starting over at least once more. The idea for the palette came all of a sudden - one of those flashes of inspiration that must be jotted down immediately. Luckily, I had all the colors that I needed, so there was no delay in starting. Now I just have to get well enough to finish. An interesting trend in the world of beading is: the smaller the beads, the bigger the design. Big beads are great for simple stringing, but tiny seed beads can transform into elaborate masterpieces. 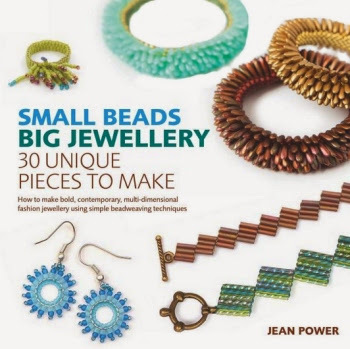 Proving this with her new book on bead weaving, Jean Power showcases the amazing potential of seed beads. There are thirty gorgeous beadwork projects, with ten pieces by designers handpicked by Jean from around the world. 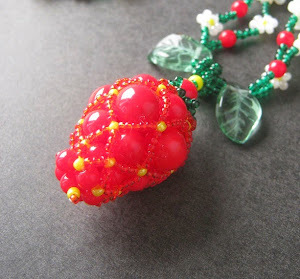 Justine Standaert represents Mexico with amazing acai jewelry, Maria Lindemann of Denmark shares delightful peyote patterns, plus many more - including myself. It was a great pleasure to share a bracelet tutorial for chain link right angle weave! Following a quick basics overview for beginners, the projects are arranged by difficulty and technique. Each section starts with a primer on the relevant stitch, such as peyote or herringbone. Then readers can learn to make three or more gorgeous pieces of jewelry using the technique. Every project showcases the amazing versatility of small beads with simple techniques like Celinni spiral, and adapted designs such as herringbone beaded beads and 3-D beadwork. Jean shares one of her famous techniques for geometric peyote triangles, and there’s even a fringe-tastic variation of spiral rope that takes the stitch to all new heights. Full materials lists and large, full color diagrams guide readers through the steps, and there are plenty of variation examples to inspire new pieces. Small Beads Big Jewelry also includes a wonderful Q&A section with all 11 designers, providing tips and advice for new beaders who want to dive into the craft. More than just a bead weaving basics title, this book inspires a love of seed beads and all the amazing things that they can do. I would like to thank Jean Power and everyone at Quarto Publishing for the opportunity to take part in this wonderful publication, and for providing a copy of Small Beads Big Jewelry for this review. Inspirational Beading has not received compensation for including products in this post; however, actions you take from this page can result in a commission for Inspirational Beading. This week I’m continuing with my top secret prototypes, including some pretty spring bracelets. I can’t show you the projects just yet, but the colors are proving to be really fun. Green and lilac and soft beige together have just the right amount of flowery sweetness. I've also been trying out some new threads, and hopefully I'll be able to share the thread brand comparison later this year, as promised. It’s been many, many years since I've worked on a single design multiple times for practice and to test out patterns and color. What’s interesting is how much inspiration is coming through for other designs while I work steadily on repeats. Next week I'm taking a quick break to make a new collar with colors that really pop. The medallion project is also coming along nicely. Three are finished so far with more on the way. What makes these pieces really great is that I didn't design them - more on that later! Anyone who has attempted to learn peyote stitch knows that the first 3 rows are the biggest hurdle. One of my favorite tips for getting the hang of peyote stitch is to gain the muscle memory for the weave before tackling those difficult first rows. Weaving peyote from another raised bead stitch such as right angle weave or picot trim allows you to practice the stitch from a steady base, creating the familiarity needed to get a smooth start when working from traditional peyote. As far as ingenious inventions go, one of the best for the beading world is most definitely the Quick Start Peyote Panel. These simple tools offer a makeshift base for starting peyote stitch that perfectly mimics the raised beads of a second row. With these cards, beaders can practice the weave without other stitches, and turn first pieces into beautiful finished projects. The deceptively simple tool allows any beader to get perfect results the first time. The cards are really simple to use with either Delicas or round seed beads - set up takes about three seconds and then weaving begins. You can use all or some of the slots in the card to start a row of peyote in even-count, odd-count or two-drop. Once you’re ready to remove the card, the beadwork is easily released and ready to finish as desired. 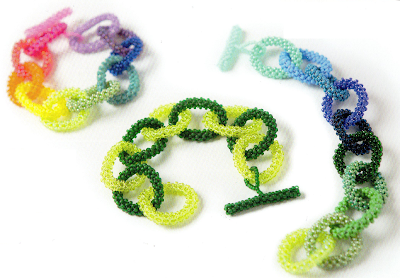 Reusable Quick Start Peyote cards are available in a variety of popular seed bead sizes, including 15/o and 8/o. They can also be used to start other stitches like right angle weave and Ndebele herringbone. To see a peyote panel card in action, watch the Even Count QSP video on YouTube. Have you tried Quick Start Peyote cards before? I would like to thank Deb Moffett-Hall at PatternsToBeads.com for allowing me try try Quick Start Peyote Cards. Inspirational Beading has not received compensation for featuring products in this post. Nothing fuels inspiration quite like a collage, whether it’s clipped and glued or a digital mood board. With so many different and varied things happening in my workspace right now, I’ve been craving some creative time that’s totally freeform and experimental. To shake things up a bit, I wanted to try a new approach to jewelry collage from the usual Wear It Twice segment. Rather than focus entirely on fashion, I wanted to gather ideas and designs in one place along with gorgeous beads. To start this new experiment, I went in search of a great statement necklace. The one I found features a wonderful collection of pearls and charms, with a summery mix of flowers and tropical colors on a black backdrop. This piece has plenty of personality to go around. This collage turned out pretty well for a first try, and I’m looking forward to seeing how the idea evolves! To top off the inspiration, I found some really fantastic jewelry tutorials featuring similar styles and beads. 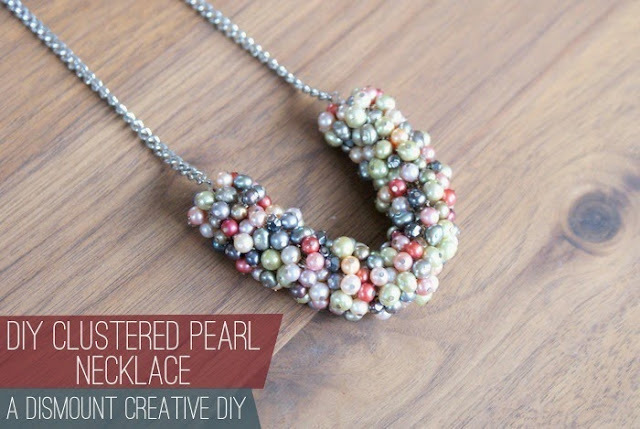 Collect a gorgeous bunch of touchable pearls in your favorite colors with the Clustered Pearl Necklace tutorial from Dismount Creative. 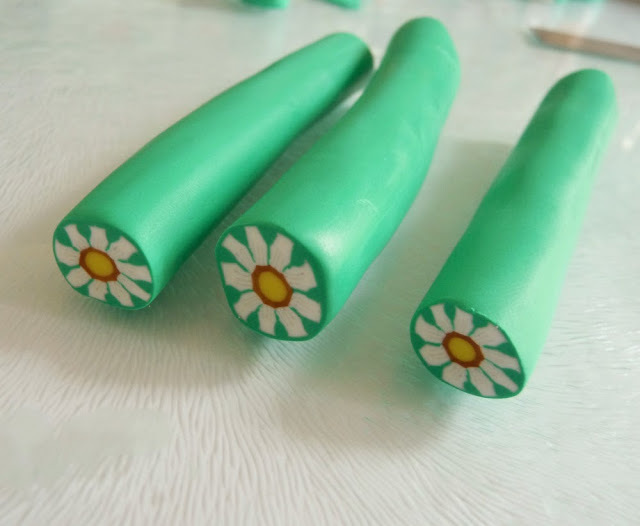 Create some unique flower components with polymer clay using the Six Petal Flower Cane Tutorial from tooaquarius. Mix fibers and beads in a cute Flower Ribbon Necklace Project from Panda Hall. 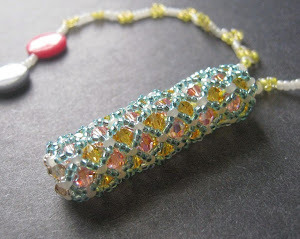 The Montery Pop bracelet tutorial from Artbeads.com combines kumihimo with long magatamas for tons of texture. And for good measure, one more lovely Flower Cane Tutorial for polymer clay from Georgia P. Designs. My top secret projects and beading experiments are moving along, and this week I’m working with a little right angle weave. It’s tough to explain how excited I am about the soft neutral palette for this project without letting the secret out, but perhaps its enough to say that I’m incorporating a new bead color that’s simply gorgeous. Pearl cream Czech seed beads are among some of my new gold replacements, and it’s amazing how well they work with different colors. I can’t wait to use more of them in the future. The medallions that I was working on are mostly complete. Some didn’t work out at all and have been added to my scrap pile, while the special embroidery pendants are turning out great. I’m not quite ready for the big reveal just yet, but it should be coming soon! A winner has been selected in this month’s bead giveaway draw. Congratulations to Sandy, and thank you very much to everyone who entered. This time around, I asked what your favorite transparent bead colors were. Transparent blue and purple were definitely in the majority! Whether it's intense cobalt or rich amethyst, these two hues are gorgeous when they're clear and full of light. Sandy says that she loves the blues and purples of opals - a perfect combination for spring designs. 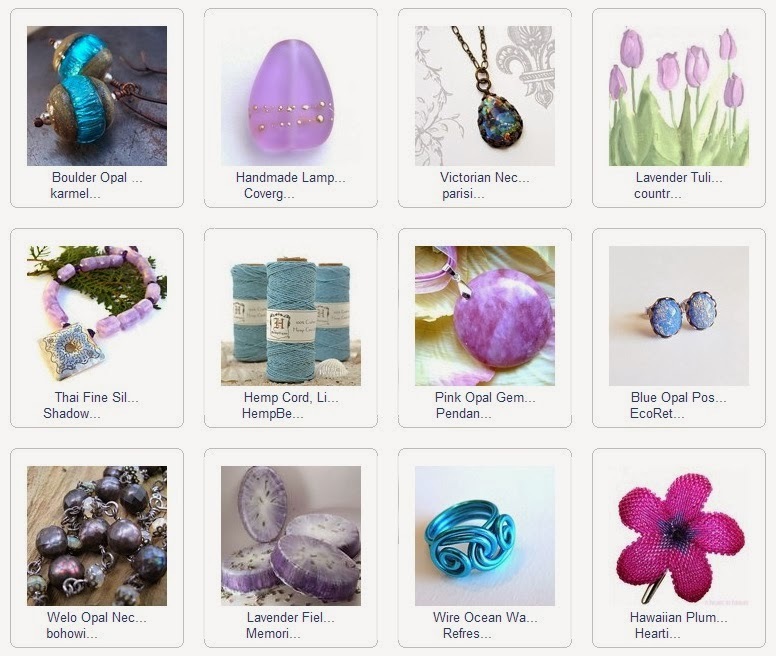 Soft blues and lavender mixed with dreamy iridescence have a wonderfully soothing effect. Add a dash of lemon or lime and you’re ready for a day in the park! For all of the millions of bead styles available around the world today, there are a million and one ways to combine them into gorgeous jewelry. Finding just the right method to display a gorgeous focal or set of lampwork beads can be a challenge, and it helps to start with a theme to focus on that will showcase the qualities that you love about your chosen materials. In Creative Beaded Jewelry, the talented beader Carolyn Schulz uses inspirations from Asian art and design to capture the essence of great beads. With themes from China, Japan, India and Tibet, some of the best bead qualities are highlighted in easy to make designs. Color, texture and pattern are combined with favorite stringing techniques that every bead lover will want to try. Each chapter in the book highlights a different stringing material, with a basic overview of how to use it in jewelry design. Quick and delightful projects for necklaces, bracelets, rings and earrings follow, with bead combinations inspired by traditional and modern aesthetics from the East. Beginners and experienced beaders will love the new and improved takes on using elastic cord, memory wire, stringing wire, knotted cords, and chain. Every project provides inspiration notes, a full materials list, and step by step instructions with helpful diagrams. 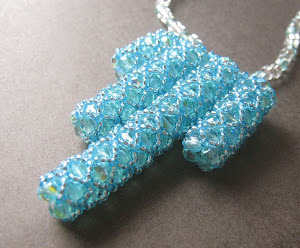 Many of the projects are deceptively simple, and are perfect for instant gratification beading! Carolyn has captured some truly gorgeous inspirations in the 33 projects, which include plenty of jade, pearls, and floral patterns. If you love the look of Asian art, or just need a great resource for busting your bead stash, Creative Beaded Jewelry will not disappoint. 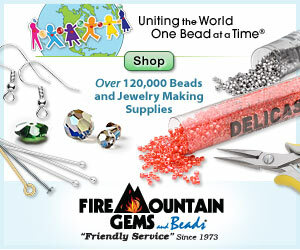 Actions you take from this page can result in a commission for Inspirational Beading. 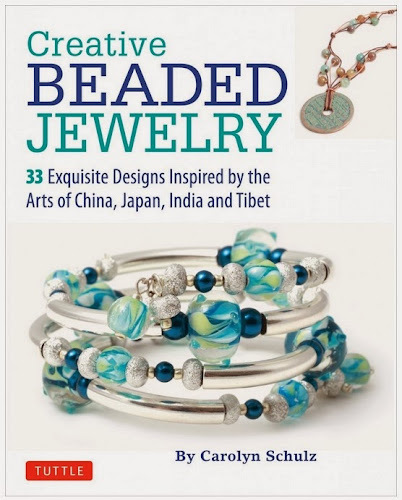 I would like to thank Tuttle Publishing for giving me the chance to enjoy Creative Beaded Jewelry. Inspirational Beading has not received paid compensation for including the book in this blog post. I have shared my honest opinions about this book. Many shapes and patterns are always appealing wherever they go. Some are comfortable and familiar, while others inspire energy and vim. Spirals, rainbows, and concentric circles are just a few examples of the motifs that draw us in time and again. Polka dots are also a favorite pattern - they’re cheerful and carefree in any palette. Sometimes they can remind us of a favorite fabric, or of natural pleasures like lady bug wings. This month, I did a little color experiment with spotted glass eye rondelles from Happy Mango Beads. With a soft lavender gray as a base color, the overlapping yellow, green and red dots really stand out. These Java glass beads are both youthful and organic, with a little tribal flair. The first trio has all the elements of an early spring day - a bright blue sky and new eggs in a Birds Nest. I started with a little contrast by adding some turquoise blue Czech white hearts. The light-filled color works perfectly with the bright polka dots. Then I added a little more light in a neutral color with transparent dark topaz seed beads, adding to the earthy effect of the accents. Moving down to the ground for a Ladybug Picnic, I started with some spring green seed beads in opaque cactus. This lively shade looks fantastic with the dark yellow spots, as well as complimenting the pale green ones. The palette is finished with a double dose of color in gorgeous red lined sapphire. The final trio brings to mind new baby chicks with a focus on sunny yellow. Opaque dark yellow 8/o seed beads provide a vibrant backdrop for the polka dots, while lustered orange adds a little warmth. Despite the intense colors, Cheep Cheep is comforting, while also bringing to mind lots of tasty Easter treats. Do you have a favorite bead finish or pattern? What do you like most about it? This week I’m working on a variety of projects all at once, and they’re all a bit of a secret. If everything goes well I’ll be able to reveal some interesting new embroidered medallion pendants next week, and I can’t wait to show you how that experiment turned out. There's a special twist to the design, and I can't remember the last time I was so happy beading. More on that to come soon! I’ve also got some test projects going, and those won’t be revealed for several months. It’s hard to keep a secret when it involves beads, but this one will definitely be worth it. I can tell you that the piece I’m testing this week includes a combination of several different stitches, and some lovely zebra pearls. I’ve been eager to use those for a long time now, and this piece was the perfect place for them. Winter cannot last forever, and for those of us who are still stuck in the snow, all we need is a little color to keep us going until it’s over. This month’s giveaway is a welcome splash of light, with a colorful assortment of vintage transparent beads. First we have a beautiful batch of lavender colored acrylic round drops. These 6mm beads are incredibly sweet with just the right shade of soft purple. I’ve also included a custom mixture of yellows in assorted shapes, and green pear drops that are totally disco. The way that transparent beads pick up and capture the light makes them perfect for spring designs, and these ones don’t disappoint. For a chance to win all of the beads shown, simply leave a comment on this post that answers the following question: What is your favorite transparent bead color? Important: Comments must be made here on Inspirational Beading to qualify. Please make sure to include a contact method in your comment, or through your profile, so that I can get in touch with you if you win. Incomplete or duplicate entries will not be included in the draw. One lucky winner will be drawn on Tuesday, March 11th. This giveaway is open to all international readers. If you are a beader who loves beads not just for the jewelry that it can create, but for the sheer beauty – the very beadiness – of them, then you’ve probably spent at least a little time experimenting with a variety of bead inspired craft projects. Whether strung, sewn, glued or stitched, beads have a versatility that is unmatched by any other medium. In Creative Quilting with Beads textile artist Valerie Van Arsdale Shrader has compiled a wonderful assortment of quilting projects with gorgeous bead embellishments. A quick flip through the pages offers a wealth of inspiration to anyone who loves to combine beads with color and texture. There are over 20 projects in all, with designs by artists such as Julia Donaldson, Larkin Jean Van Horn, and Sarah Ann Smith. The basics section covers everything you need to know about the materials you’ll need to try out the projects, including tips for conditioning thread and setting up your workspace. There are brief explanations of machine quilting and hand embroidery techniques – to master a complete project you’ll want to be familiar with the basics of operating a sewing machine. Even without these skills, the projects are a wealth of inspiration. The project pages include templates and full color photographs of finished designs, with clear step-by-step instructions. More than just blankets, quilting combined with beads to make a variety of beautiful keepsakes such as magnets, pillows, art dolls, and wall hangings. Each piece uses beads to tell a story or capture an idea. 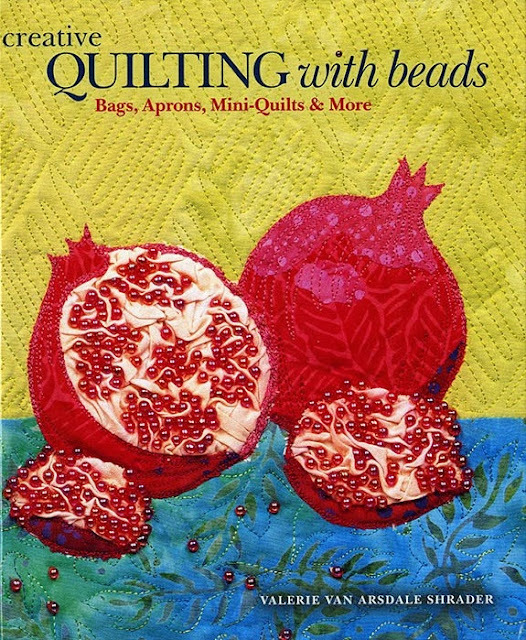 If you’re having a craving for some mixed media creativity, or want to bust your stash in new ways, look for Creative Quilting with Beads at your public library.